We all know very well that the first step to have good VLF receptions is an "electromagnetically quiet" place. Often it is not easy to find a place with this requirements for continuative monitoring and in case of portable stations the recordings are necessarily short, let's say one or two hours at the most. As Renato use to say, there are very rare phenomena on the air, without a continuous monitor the probability to catch them is very low. For this reason I tried to connect my good old RS4 receiver to my ham aerials, just to see what's going on. With a big surprise I found out much more than hum noise. Currently I have on my rooftop two dual band antennas, a Comet 2x4 MAX, a Diamond X30 and a self-made windom antenna for HF bands, plus a spare cable (open at the top). The length of each cable is about 30 meters. I am experiencing the best results connecting RS4 to the HF antenna cable or to the Comet one (only central pin, not the shielding). Due to this fact I know that my antenna is composed only by the cable but I have different behaviors with different cables. For example, the open cable is a generator of noise, like the one connected to the Diamond antenna, the other two works much better. My RS4 has some little advantages, it includes a little filter for 50 Hz hum (better than nothing) and its power consumption is about 7-8 mA. With a 12V 2Ah Pb-Gel sealed battery it can operate continuously for several days. Earth bonding for the receiver is absolutely necessary. 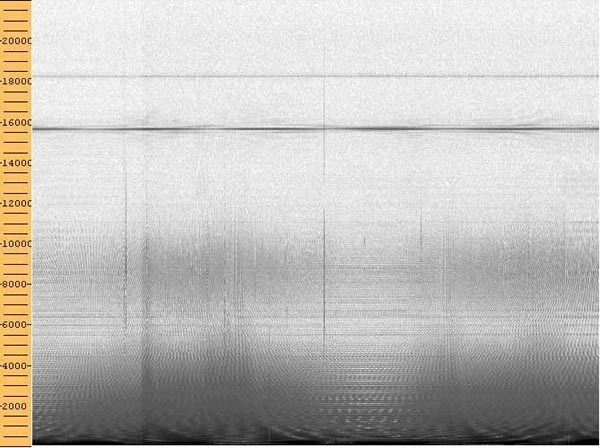 This spectrogram shows about 11 seconds of recording in the range 0-24 kHz. Man made noise is present up to 6 kHz, but also I had good RTTY signals and often very good signals from Alpha Radionavigation system (in this picture in a unusual configuration). And of course a good number of statics. Pic has been taken with Spectrogram demo version. Background noise level has great variations during the day. In this b/w pictures you can see a "lucky strike", I cought a CW transmission from Russian RKS station. 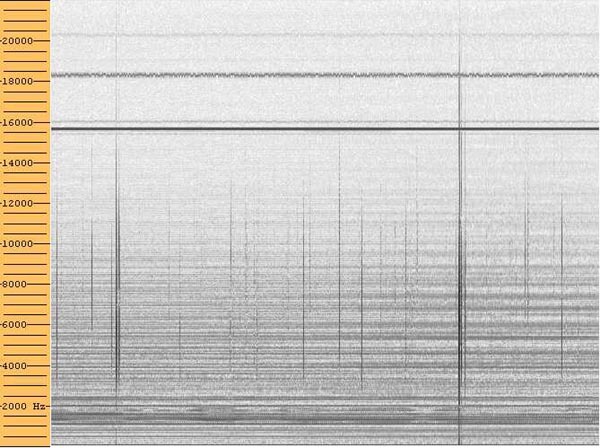 Also presents some carriers just under 16 kHz (typically 15625 Hz) , most probably caused from neighbor's TV set. These kind of signals disappears during night time. By the way, a system like that is not good for frequencies under 6 kHz. If your purpose is to monitor RTTY or slow CW activities it should be ok, but if you want to listen some statics/tweeks/whistlers something has to be made to clean up the spectrum from the rubbish. Consider also that designing and building a hardware filter is not easy, and often take a long time for adjust. When a unexpected source of noise is found (i.e. TV set) we need a flexible system to cut it out of the spectrum without building new pieces of hardware. Even more, a receiver equipped with all this hardware will be more noisy (and complicated). Renato suggested me to use Spectrum Lab, by Wolf DL4YHF. It includes a powerful set of real time filters, delay lines, echo lines, local oscillators, mixers and all you need to design filters by yourself. The program can be found at Wolf's homepage . Actually I am not very skilled in filter design but thanks to the information included in the user's manual I have been able to clean up all the stuff. 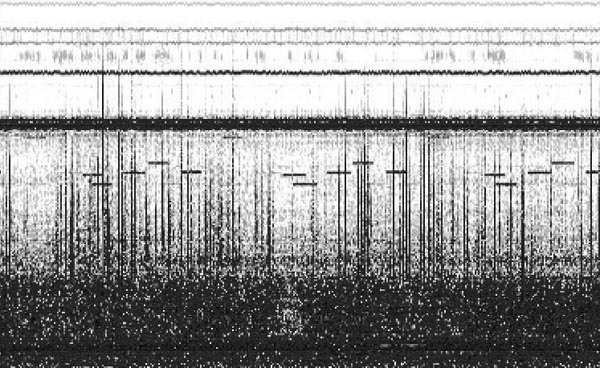 In the image on the right it is possible to see the man made noise spreading up to 10 kHz. This pic has been taken early in the morning, during the day the noise is even worst, due to industrial and home activities. It's easy to record elevators, TV sets, switching power supplies for halogen lamps, electric mixers, drills and so on.. This picture shows 1'30'' screen shot, full frequency span. (Factors of -1.0 and +1.0 also work, but they amplify the signal). This removes 50 Hz (1/0.02sec) and all harmonics of 50 Hz by adding the signal delayed by 20 ms to itself. The image on the right has been taken using my loop antenna (Bikeloop) and Easyloop receiver. 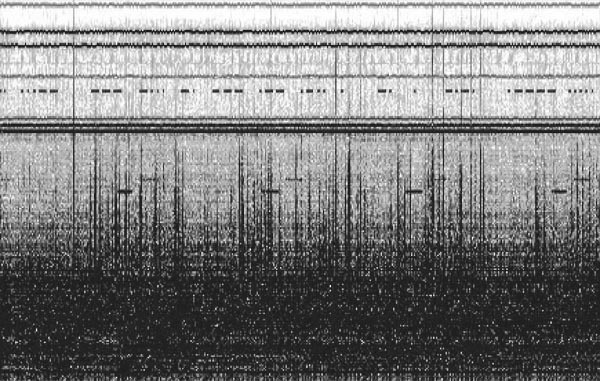 As you can see, there are very few statics, also the carriers on the higher part of the spectrograms are caused by local man-made noise. The picture on the left has been taken under the same conditions of the previous, but now the filter for 50 Hz and harmonics has been applied. 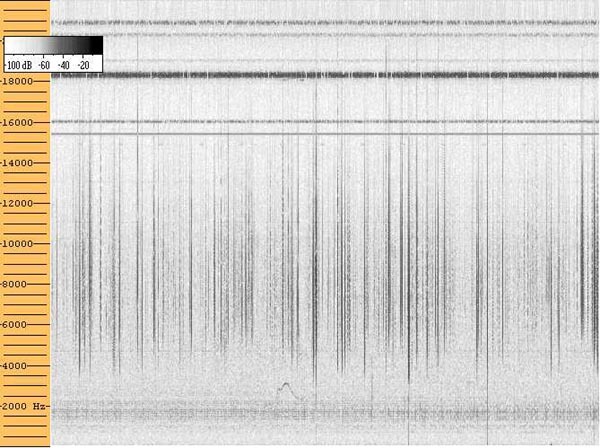 The gaps in the spectrogram are caused by filter, but there are not big benefits, probably because the interference are complex harmonics of 50 Hz, added with other spurious emissions. As you can see in the examples, the use of receivers for electrical field seems to achieve better results. Magnetic aerials needs to be put far away from relevant metal masses, but often this is not possible. On the other side, the results obtained with digital filters and electrical field receiver are impressive. Plus, it could be a nice and challenging idea to play with VLF using your existing aerials. When using cables connected to VHF/UHF antenna (or provided with BALUN) just remember to disconnect earth from the shielding and leave shielding unconnected. This is because most VHF/UHF antennas have an induction coil who shorts radiating element and shielding (to eliminate static charges). The coil is tuned for VHF frequencies and up, and it eliminates all the static and signal we want to receive. The same happens with BALUN. Spectrum Lab also allow users to program periodic actions, such as image capture. In this way it is possible to monitor continuously what's going on, in particular during the night time. It has also many other interesting features, please refer to the extensive manual for use them properly. My opinion is that, under certain conditions, VLF recordings are possible even in big cities or in locations not "VLF-compliant". A good 50 Hz hardware filter is suggested anyway. Hum is present almost everywhere and the filter will always find something to do. The rest of "dirty job" can be done by DSP. To avoid intermodulations caused by local strong signal, i.e. close broadcasting transmitters, a simple low pass filter with frequency cutoff about 50-100 kHz could be needed, depending on your location. Of course receiver has to be constructed in the right way, it has to be quiet, not noisy. In few words it has to be a good receiver. DSP can help in many circumstances but cannot increase the performances of a poor receiver. I hope, as usual, that these few lines could help someone else to get involved in the wonderful world of VLF...! Many thanks to Renato for pushing me to try this program and thanks also to Wolf for Spectrum Lab.